Yesterday (Labor Day, 2000) I rode the "Dora Doodlebug." In the antique shopping mecca and senior citizen haven of Mt. Dora north of my home, there is a section of the old Seaboard Coast Line Railroad that is being leased to a "fictional" street car line called the "Mt. Dora Scenic Railway Company". I say fictional since no street car line ever served this section of track. It is simply a scenic out and back trip on a semi restored Brill trolley. It serves as a breezy ride along a lake and through the woods. Provided with padded seats, it serves as a comfortable refuge after an exhausting day of tramping through the hot streets of the town, wandering in and out of antique and curio shops. While we were not there to purchase antiques, we were there for the trolley ride. Heresy, you say? Yeah, I know, but this was research. 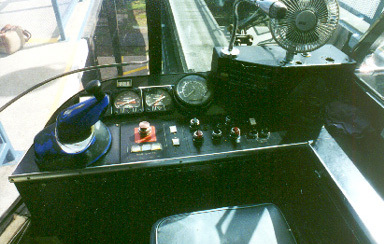 You see, ever since getting a few trips back and forth at the controls on the Seattle ALWEG monorail in '95, it has stuck in my mind how similar the controls on those old trains were like those in an antiquated trolley. Sure, they've been updated by 1962 standards, but basically they're the same. You've got a lever to choose direction, a brake lever and its accompanying pressure gauge, and a propulsion selection handle. One might argue that this arrangement, even though light years behind in development, is basically the same as the Mark VI monorails at WDW. True, but it doesn't look the same. The ALWEG trains in Seattle have bare metal levers for the brakes, just like that old trolley. Even the propulsion control operates in a similar fashion, swinging on an arc to control the flow of "juice" to the motor. The motorman sits in his "box" with all of its controls just like the venerable trains in Washington; passengers even rush to the prime seats near him to watch the operation just like on the monorail. Enforcing that feeling of having stepped back in time, the men operating the former Philadelphia street car wear the classic trolley man's uniform: navy pants and vest, white shirt, tie, and hat with the appropriate title of Motorman or Conductor. When Dr. Wenner-Gren [the developer of the ALWEG monorail] set in motion the evolution of modern monorails, did his designers envision an elevated street car with different running gear and track? Surely, other major differences are obvious. Lack of catenary is fairly obvious, but who misses it? Some streamlining seems to be built into all modern monorails, maybe to enforce that feeling that this is something new and different? Was it simply economics that dictated sticking with a tried and trusted method of operation by familiar controls? Why re-invent something that already works so well? Books containing the histories of long defunct street car lines always abound with stories of men, who in their youth, crammed to the front of the car to watch the motorman perform his tasks. Why are we so fascinated with knowing how things work? Monorail drivers in Seattle, at Disneyland, and Walt Disney World can attest to the popularity of the prime seating. The "war stories" they would share could fill a forty book volume. In an attempt to not offend, I'd title it "'Interesting Things Heard by Monorail Drivers." Why, my own wise cracking answers to "What are we running on?" could fill several of Letterman's Top Ten Lists. At the Dallas Zoo, I was invited to sit in the cab with the driver and in between spiels, she explained the train's operation to me. On Dutch Wonderland's monorail, several of us crammed into the cab for the driving lesson and at the Philadelphia Zoo and Geauga Lake systems, the open nature of the cars allows passengers sitting behind the cab to see every aspect of its operation. The New York World's Fair AMF Monorail's controls were in the open for the passengers to see, even providing a button so that children could blow a horn at the appropriate time. On the Mud Island Monorail in Memphis--a system that because of its cable drawn technology we usually don't like to speak about--the controls are in the middle of the car. All eyes are on the operator when work is being done in this area, despite the presence of that big old muddy river and the grand vista of the city. These systems seem better for the opportunity they afford passengers to learn about their procedures. Some systems don't welcome rider interest. In Las Vegas, the wording at the bottom of the cab windows spells it out; "Cast Members Only." On the monorail that formerly ran at Busch Gardens in Tampa, drivers used to grow weary of guests asking for the seats with the driver, forgetting that they were not at Disney where such is possible. At the Miami MetroZoo a tall partition separates the driver from prying eyes and pesky questions. On the Tampa International Airport monorail, on Jacksonville's Skyway Express, and the Newark International Airport monorail, operation is automatic and control systems are hidden away in onboard electrical lockers. The Riverside Park and Bronx Zoo monorail drivers openly shunned interaction with passengers, retiring to their cocoons to fiddle with their gadgets. Though all of these systems serve(d) as showcases of efficient monorail operation, I can't help but think that some passengers came away without the taste of newness and innovation inherent in most first monorail trips. Someday, when monorail systems have passed their zenith of popularity (and let's hope that it is a long way off) there may be books about how they operated, where they ran, and why they died off, just like the trolley history books available to us now. Like those books, "ours" will be filled with reminisces of old men, passengers and drivers alike, who will describe their rides, their duties, and their fond memories of how they were run. Can we draw the same conclusions that we can learn from the trolleys? Now, history buffs talk about the trolleys in Boston, Philadelphia, New Orleans, and several other cities where left over antiques make excursions to yesteryear. Boring systems like D.C.'s Metro, Miami's Tri-Rail, and Atlanta's MAARTA will all be ignored as the soul-les transit they are. In our future, will we recall those monorails that allowed us a peek behind the mystique of operating a modern train? While it would be easy to regret not being allowed to sit with the driver of the recycled Mark IV in Las Vegas, we certainly will recall with fondness our conversation with the driver of the Mark V at Disneyland. Could this be the secret to longevity for those contemplating new monorail construction?